“Don’t fear the schmaltz!” I often have the urge to holler this phrase from the rooftop… or at least from the top of my kitchen stepstool. Schmaltz (aka rendered chicken fat) has received a bad rap over the past several years, in large part because it contains cholesterol. Recently, however, schmaltz has been “rediscovered” as a cooking fat due to a renewed interest in the work of Weston A. Price and the paleo diet. It’s an important ingredient in many traditional Jewish recipes, and is a must-know for anybody wanting to prepare authentic Ashkenazi cuisine. Historically, it was used by Eastern European Jews who needed a kosher, dairy-free cooking fat that could be served alongside meat. Goose schmaltz was the more common choice in Eastern Europe. Jewish immigrants to America began to rely on chicken fat as chicken meat was more popular and easier to obtain. Schmaltz fell out of favor in the U.S. with the advent of margarine, shortening, and other processed non-dairy fats. While I don’t promote the overuse of schmaltz, I do vastly prefer it to processed alternatives like margarine. In moderation, schmaltz is an underutilized cooking fat that can add a tremendous amount of flavor to your cooking. In this recipe, a traditional French potato preparation takes on a new personality with the addition of schmaltz. Potatoes Lyonnaise are usually made by frying onions and pre-boiled potato slices, usually in butter or olive oil or a combination of the two. Some preparations call for animal fat, but most rely on butter for a rich flavor. 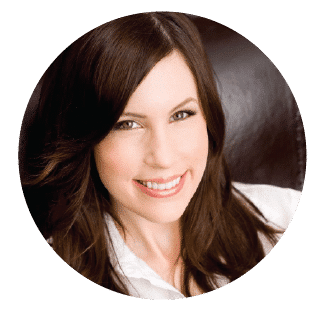 Here, I’ve used chicken schmaltz along with olive oil to infuse the potatoes with meaty, dairy-free flavor. Caramelized onions, lots of salt and pepper, and a sprinkling of chopped fresh dill make this a somewhat Yiddish-inspired take on the French dish. Idaho potatoes are a great choice for this dish, they cook up crispy and golden brown on the outside, light and fluffy within. 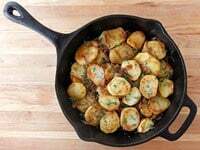 You can serve these Schmaltz Potatoes Lyonnaise with a kosher meat meal because they don’t include any dairy; they’re also gluten free and kosher for Passover. To learn how to make schmaltz, click here. You can also purchase frozen schmaltz in most kosher markets. For a terrific iPad cookbook written by Michael Ruhlman that is completely dedicated to schmaltz, click here. 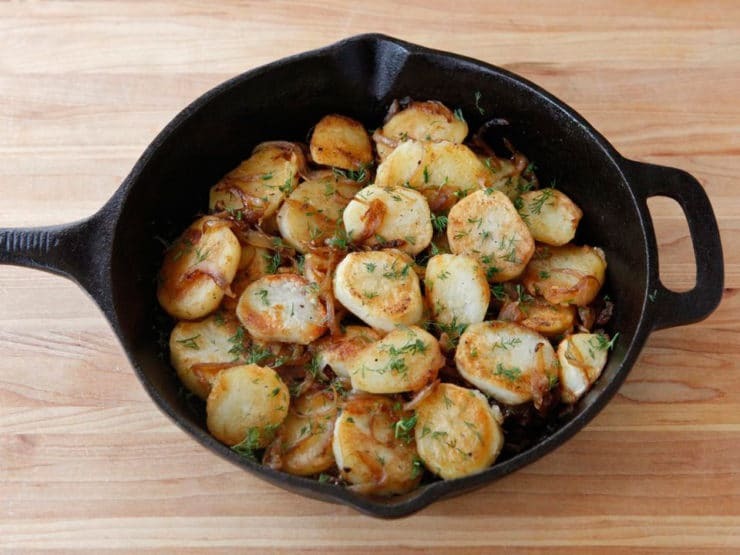 A classic French potato dish with a Yiddish twist. Potatoes Lyonnaise made with schmaltz, caramelized onions and fresh dill. Kosher for Passover. 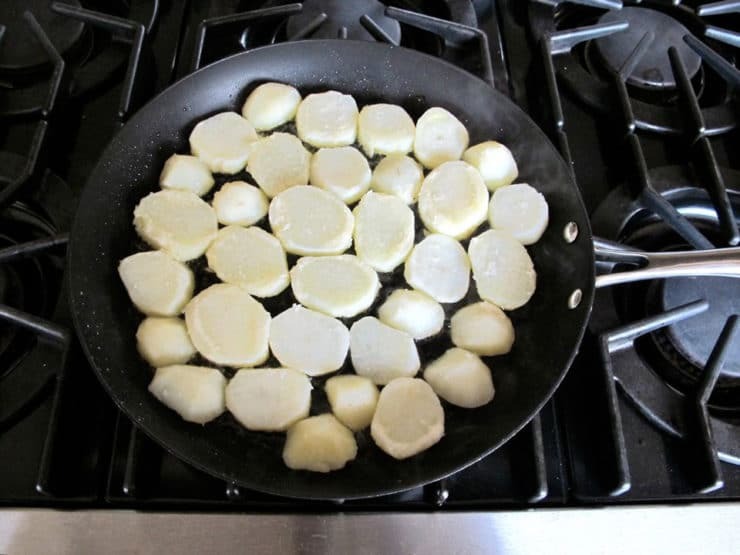 Place the potato slices in a medium pot, cover them with water and ½ tsp salt, and bring to a boil. 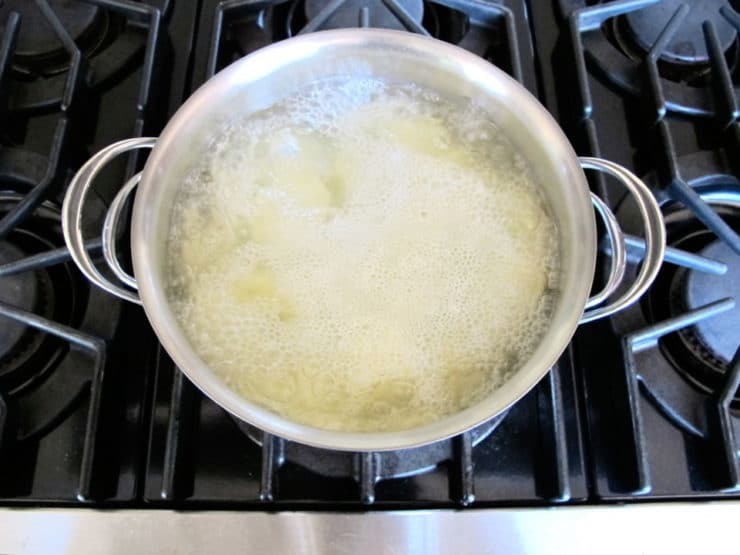 Once the potatoes reach a boil, let them cook for 4-5 minutes till they become just fork tender. Watch carefully, they can easily become overcooked and soft if you don’t watch them like a hawk. As soon as they’re cooked, drain them in a colander. 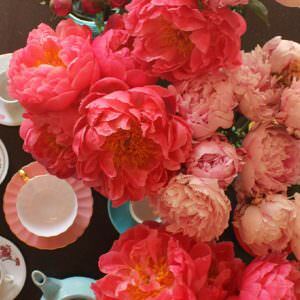 Spread them out in a single layer on top of a bed of paper towels and gently pat dry. Let them cool to room temperature. Meanwhile, heat olive oil in a large nonstick skillet over medium till hot. Place the sliced onions into the skillet, sprinkle with salt and pepper, and stir. 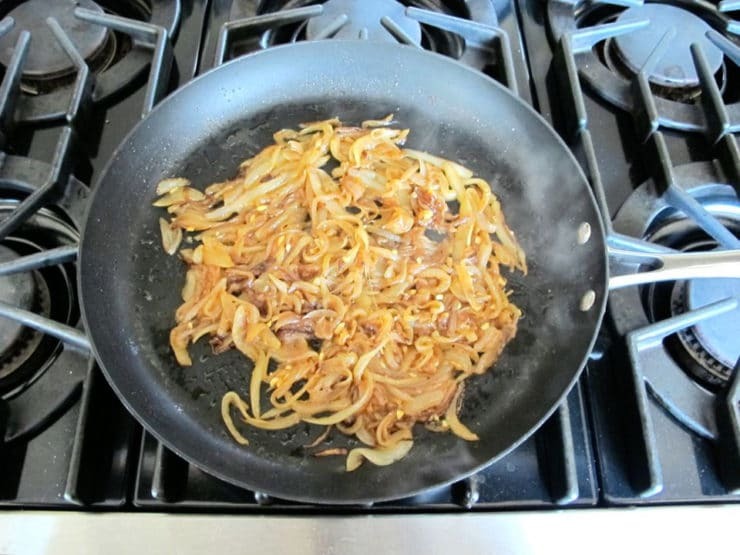 Cover the skillet with a lid, reduce heat to medium low, and let the onions cook for 15-20 minutes, stirring every few minutes, till the onions soften and caramelize. During the last minute of cooking, add the minced garlic and sauté till fragrant. Pour the cooked onions out of the skillet and into a bowl; reserve. Melt 2 tbsp of schmaltz in the skillet over medium high heat. 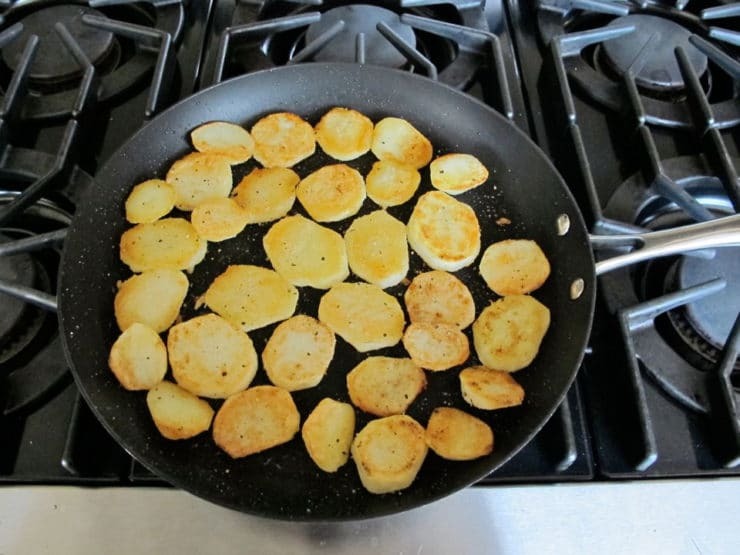 Place the cooked potato slices into the hot schmaltz spread out in a single layer. Let them fry undisturbed for 6-8 minutes till golden brown and crisp. Flip the potatoes, season with salt and pepper, and continue to fry for another 5-7 minutes till golden. 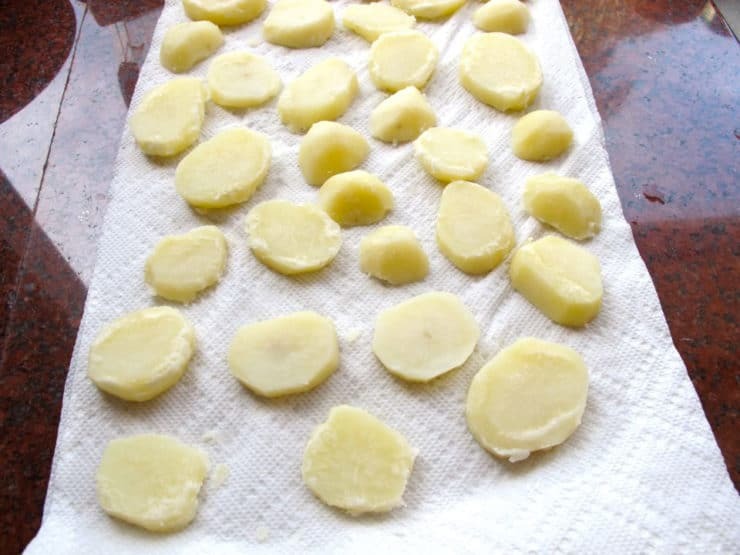 Remove potatoes from heat. Stir in the sautéed onions and garlic. Sprinkle with fresh chopped dill. Serve. Why boil the potatos before “browning” them? Won’t browning them also cook and soften them? Seems like an unnecessary step? This step expedites the cooking of the potatoes, so they don’t soak up quite as much grease as they brown. You can eliminate this step and simply cook the potatoes in the fat if you wish, but know that they will turn out heavier/greasier. Is rendered chicken fat the only poultry fat that is called schmaltz? Or is duck fat also schmaltz? I have such fond memories of my grandmother making schmaltz every other week for chopped liver on shabbas. Hi Lu H.– in Jewish tradition, the Yiddish word schmaltz generally refers to either chicken fat or goose fat. However, duck fat can be used interchangeably (and deliciously!) with chicken or goose fat, as it is basically the same thing, with a more duck-like savory flavor. All three are delicious. may I share this recipe and the recipe for ‘schmaltz’ with my friends Kurt (FastandFuriouscook.com)???? I love it when people share my recipes, and I would urge you to pass along a link to your friends, as long as they don’t copy the entire recipe on their own website and they link back to the original post (example: “I tried this awesome recipe I found over at TheShiksa.com, here is the link to the recipe if you’d like to try it…”). When people copy the recipe and put it on their own blog without modifying or changing it in some way, it makes me sad. It’s also a copyright violation unless they rewrite the recipe completely in their own words, and even that is frowned upon in the blogging world unless some sort of major change is made (example– “I was inspired by this recipe at TheShiksa.com, but I made some big changes, like using sweet potatoes and duck fat instead of regular potatoes and schmaltz.”) However, the best is when people mention that they have tried my recipe and link back to my original post. When that happens, I am a very happy Shiksa! 🙂 I noticed your friend has a food blog, so I’m guessing they already know all of this. But it’s always good to put it out there, just in case somebody doesn’t understand the rules. Thanks for sharing Anna! Wonderful weeknight dish. This gives me a reason to take my cast iron out, it looks so colorful in that. another fabulous, easy to prepare, recipe. thanks so much. i so enjoy your stories and recipes. a joyous passover to you and yours. Do you have to buy schmaltz at a store, or is there an easy way to make it yourself? 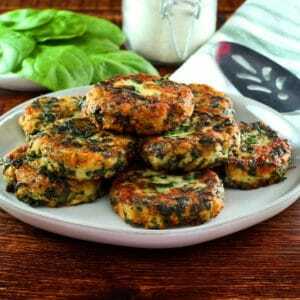 Hi Relle, read the post just above the recipe, there is a link for how to make it yourself.